The more parents talk and read to their baby, the more rapidly their baby's vocabulary develops. Babies become aware of phonemes and learn to differentiate the sounds that make up speech through interactions with parents and other caregivers. 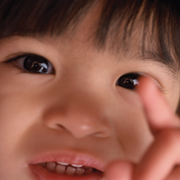 "Listening comprehension feeds reading comprehension"
Babies learn language in stages. During the first four months, babies are primarily on the receiving end of language. During the next four months, babies begin to initiate and imitate sounds. By eight months, a baby responds to her own name, distinguishes emotions by the tone of voice, responds to sound by making sounds and uses her voice to express joy and displeasure. By 12 months, a baby is paying increased attention to speech and responds to simple verbal commands. She is starting to use simple gestures such as waving "bye-bye" or shaking her head "no." She babbles with inflection and uses exclamations such as "uh-oh" and may say a few words such as "mama" and "dada." One-year-olds can typically say six or seven words (although many speak none at all and a few up to fifty) and understand close to seventy words. There is usually a five-month lag between a child's understanding of words and his or her ability to speak them. Between 12 to 18 months, a child's vocabulary slowly, but steadily increases. Most children's vocabulary explodes once he or she can say about four dozen words. By the age of two, children typically learn the meaning of eight new words a day. The more parents talk and read to their baby, the more rapidly their baby's vocabulary develops. And, according to early childhood experts, language skills grow faster in children whose parents use positive rather than negative feedback. Children who hear "no," "don't" and "stop it" have poorer language skills than children with parents who use more positive feedback. Being aware of phonemes - the smallest, unique sounds that make up words - is the basis for learning to speak and to read. Babies are quite skilled at detecting differences in sounds. This is why children are "wired" for learning multiple languages in the early years. Encourage your baby's babbling, which helps him to learn language. At about two months, babies begin to coo, using vowels sounds like "aaah" and "oooh." At five or six months, babies begin to practice sounds with consonants (b, d, j, m, n and w are the most common). One-year-olds begin to combine vowel and consonant sounds into words. Comprehension is central to the process of reading. While comprehension is reinforced in the later years when an older toddler and preschooler can follow the pictures and text to understand the meaning of a story, it is important to talk about what is happening in the books you read aloud to your infant. According to Jim Trelease in The Read-Aloud Handbook, "Listening comprehension feeds reading comprehension." As your baby listens to you read, point out clues about the story in the illustrations ("What do you think baby will do with the present?" from the book Wrapping Paper Romp) or relate a picture to something in your baby's life ("Do you remember how you ripped the wrapping paper off your presents at your birthday party?"). By using strategies like these, you stretch your baby's thinking skills and encourage greater comprehension.